RUSH: Let me give you a little factoid here that I think is gonna have relevance or at… (music fades) You don’t need to fade the music like that down to zilch. You can let it keep going for a while. There’s not enough time here in this segment to delve deeply into our next premise, which is what the Mueller investigation’s all about. But if this ever comes to impeachment, where does impeachment occur? It’s in the House of Representatives. 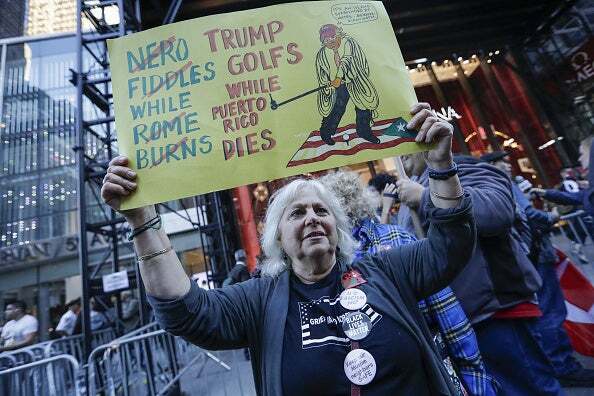 A demonstrator holds a sign during a rally outside of Trump Tower in New York, U.S., on Tuesday, Oct. 3, 2017. Puerto Rico’s Fiscal Oversight Board, created by Congress to monitor the commonwealth’s budget, asked lawmakers Tuesday to act quickly to help with recovery costs that it said could rise even higher, pointing to a Moody’s Analytics estimate that the island sustained $95 billion in hurricane-related damage. RUSH: A clarification. I know that Puerto Rican refugees are not illegal immigrants. I said that to help create a mental picture here because the point I’m trying to make is the hurricane in Puerto Rico has devastated the country and Puerto Rican citizens are immigrating to the United States. They vote in presidential elections, a territory. But they vote in Puerto Rico. Now it’s possible that these people because the publisher of the newspapers in Puerto Rico says that Puerto Rican citizens are very unhappy — and I know it’s the Puerto Rican media and I know it’s a bunch of libs, but this is what’s out there. I’m just telling you. That Puerto Ricans are very dissatisfied with the Trump administration because so little has been done to rebuild the nation, Puerto Rico. San Juan and other areas. And so they’ve been forced to leave, and the point is the number of them who have come to Florida. Right now there are about 300,000 of them in Florida, and it is, according to this newspaper editor, that number could become 400,000 to 500,000 by 2018. Now, I don’t know how many of these new arrivals would be able to vote in congressional elections next November. But certainly by 2020, if they remain and if they remain in Florida, if 60% register Democrat, you talk about 500,000 new arrivals, you know, Florida is what has given the Republican Party a chance at winning the White House. 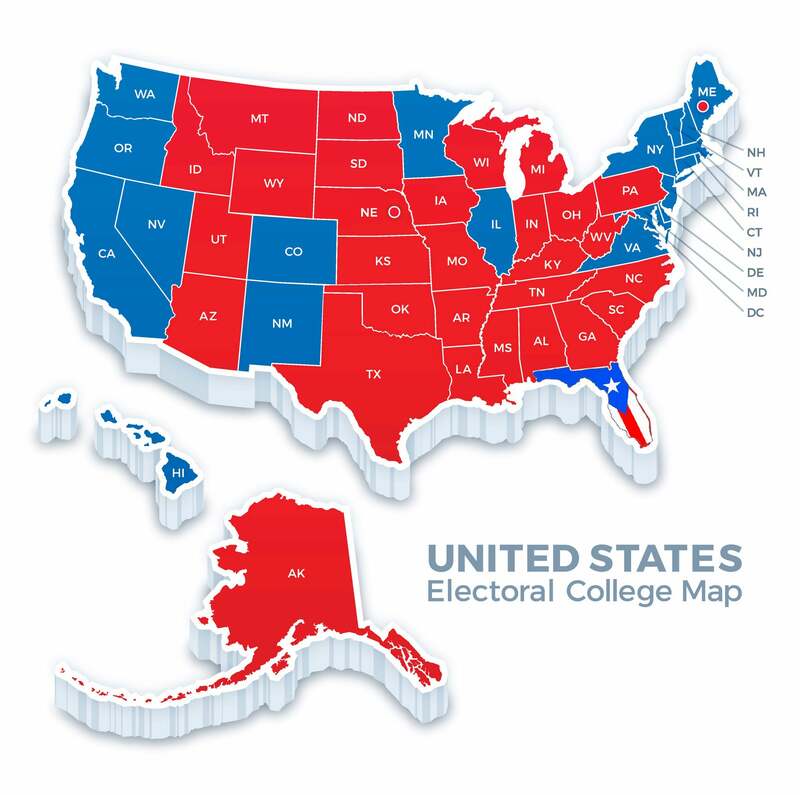 If the Republicans have no hope of winning Florida, just like there is no hope of winning California, and just like there’s no way Republicans are ever going to win New York, if that happens to Florida, then the Republicans are kissing the presidency good-bye for who knows how long. And should this number of Puerto Ricans moving to Florida impact congressional elections, say, in the midterms, well, then, if you have the Democrats after the 2018 midterms running the House, then impeachment becomes a much more relevant thing. I should say getting a guilty plea. Well, even the impeachment itself, the articles of impeachment are written and put together by the House. And then the House has what are called House managers. They are, in essence, the lawyers, and each of them are given an area of the case to become expert in, and they go over to the Senate and conduct the trial. And the Senate is the jury. There needs to be 67 senators voting to convict on high crimes and misdemeanors in order to get an impeachment, a conviction. You can be impeached without being convicted. This is another thing. Just the very existence or the very occurrence of a president being impeached is all it takes for the die to be cast. Clinton was impeached. It’ll forever be on his record. He was not convicted. The Senate wanted nothing to do with it. And many of the House managers who ran the case were so humiliated by it that they have become moderates now. Lindsey Graham used to be a Newt Gingrich conservative until he was House manager for the impeachment of Clinton. The fallout from it was so negative that in order to save face, reputation, a bunch of house managers either quit or moderated their ideological profile so that they could go forth having seen the light and not be seen as dyed-in-the-wool conservatives.